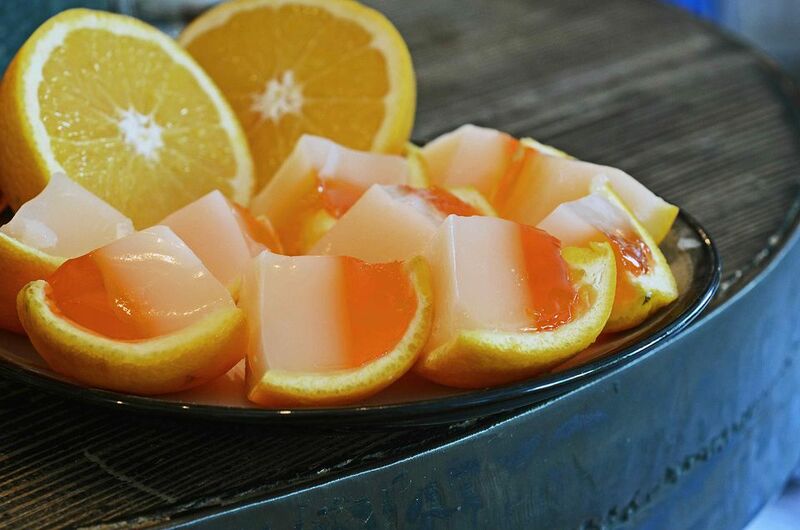 Jello shots take on an entirely different look in these candy corn oranges. They're a fun party treat for Halloween or any occasion where pint-sized, spiked oranges may add to the festivities. There have been many creative molds devised for these jiggling shooters, but this is a favorite because they use a natural mold. For this recipe, we can thank Cointreau mixologist Kyle Ford. Creating these fun treats is not as difficult as it may seem, simply follow the steps carefully and be patient, allowing the gelatin layers to set properly. Also, be aware that Cointreau is not a low-alcohol liqueur—it is 80 proof, after all—​so these are not going to be as delicate as they may seem. One other note: don't waste the orange pulp when hollowing the peels. Instead, throw them in the juicer, muddle them for cocktails, or enjoy a fresh fruit snack. If you like, you can also build the gelatin layers in shot glasses. Pour the mixture into the orange peels, filling each halfway. Refrigerate for 2 to 3 hours, or until firm. Add 1/2 cup of water, 1/2 cup coconut milk, gelatin, and sugar to a saucepan. Over medium heat, stir until the gelatin and sugar are dissolved. Remove from heat and stir in 1/2 cup Cointreau.